Thanks to Dr. Uzma Bukhari, Ziauddin Hospital (Pakistan) for contributing this case. To contribute a Case of the Week, follow the guidelines on our Case of the Week page. (1) We are pleased to announce a new Home Page for mobile devices. It has much less text, and makes navigation easier. Let us know what you think, or if you have any questions. Read more. (2) We have four different newsletters / email options you can sign up for: (a) Case of the Week; (b) Jobs, Fellowships and Conferences; (c) Website news and New Books; (d) Promotions / Commercial. Click here to find out which subscription(s) can be most useful to you! Remember, you can unsubscribe at any time. (3) Don't forget to check out a couple recently posted Webinars (from CAP and Leica Biosystems) and New Product Announcements (from Hamamatsu, Symbiodx, Kubtec and Optronics) for this month. 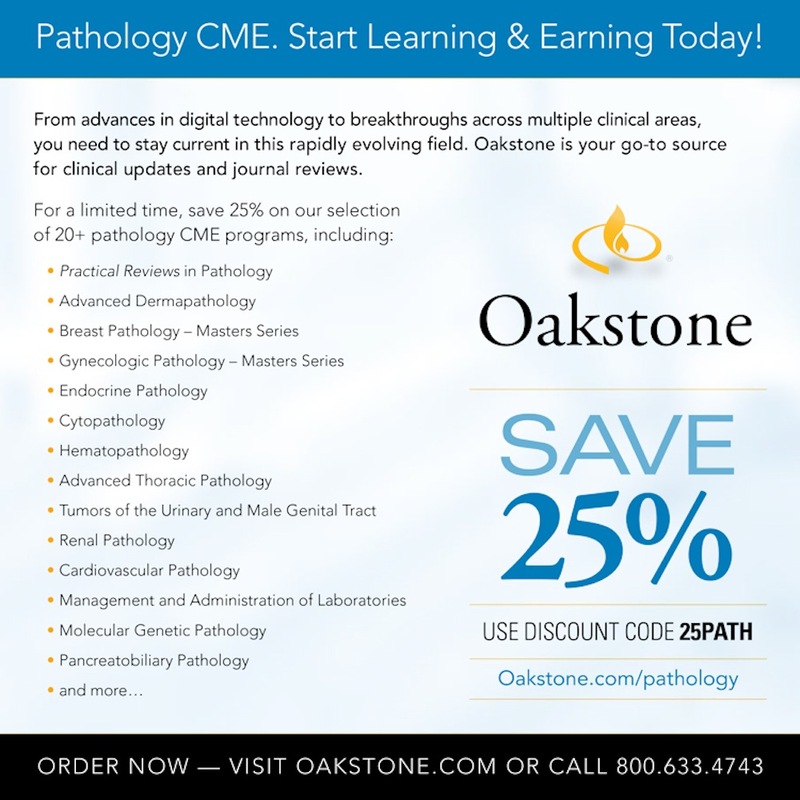 We also have a new article posted on our Management page: "How CMS Plans to Save the Equivalent of Mongolia's GDP on Pathology", by Mick Raich, Vachette Pathology. (4) Visit our Blog and Subscribe to our Posts or Follow by Email (click on the box on the right side) to see recent updates to the website. A 42 year old woman with menorrhagia for 8 years was found to have a left ovarian cyst. A hysterectomy specimen contained an ovarian cyst, 10 x 7.5 x 4.5 cm. On opening, the cavity was filled with cheesy material. Benign teratomas, also known as dermoid cysts, account for over 90% of ovarian germ cell tumors. 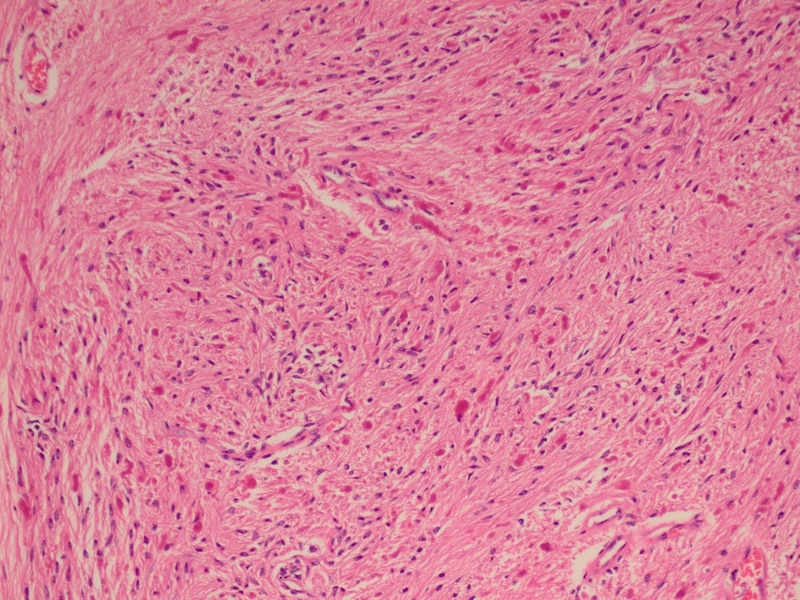 Tumors composed nearly exclusively of neuroectodermal tissue have been separated from other teratomas and are treated as a distinct group of neoplasms (Am J Surg Pathol 1993;17:764). 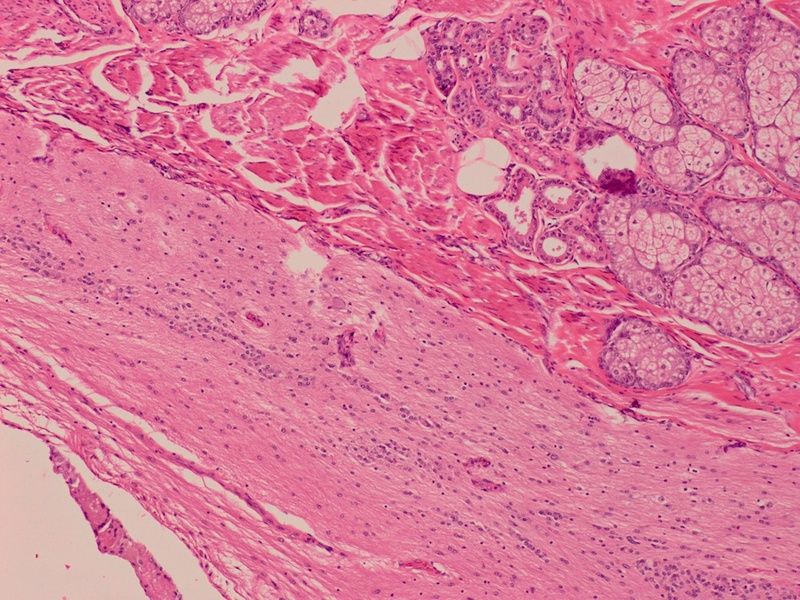 These monophasic teratomas, collectively called neuroectodermal tumors of the ovary, are quite rare, with roughly 60 cases reported in the literature. Neuroectodermal tumors of the ovary comprise ependymoma, astrocytoma, glioblastoma multiforme, medulloblastoma, medulloepithelioma, ependymoblastoma, neuroblastoma and primitive neuroectodermal tumor (Histol Histopathol 2008;23:765). Most women diagnosed with neuroectodermal tumors of the ovary are in their third or fourth decade of life, with the less differentiated anaplastic and primitive tumors occurring in younger patients. Patients often present with abdominal and pelvic pain accompanied by abdominal fullness or swelling (Am J Surg Pathol 1993;17:764). The average size of neuroectodermal tumors of the ovary is 10-14 cm (Am J Surg Pathol 1993;17:764). Grossly, most neuroectodermal ovarian tumors are solid but may be partially cystic. 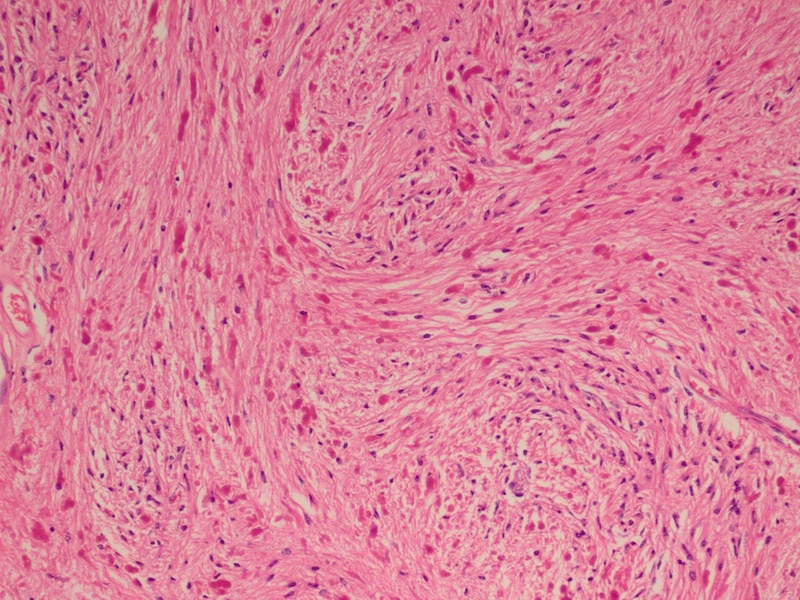 The solid areas of the tumor are composed of grayish white tissue with possible foci of necrosis or hemorrhage. The external surface is generally smooth and glistening. (Am J Surg Pathol 1993;17:764). 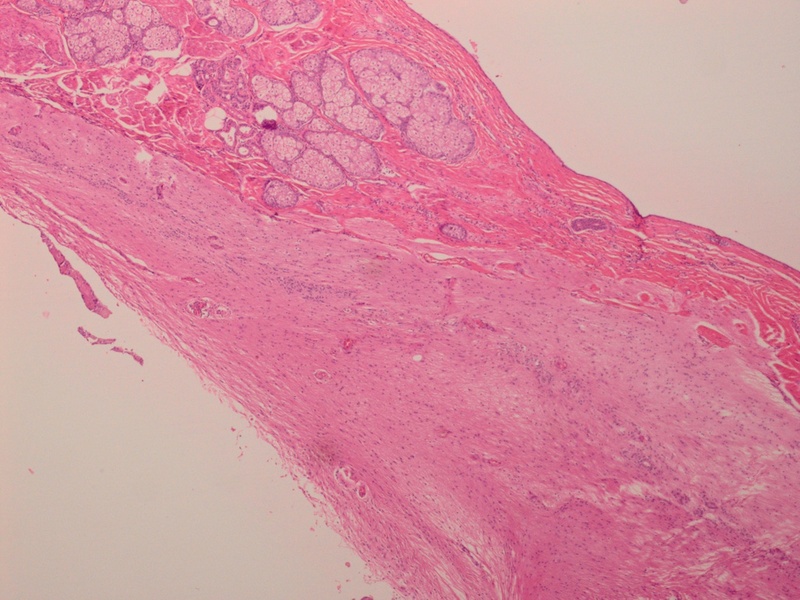 The histopathology of astrocytoma, WHO grade I, within a dermoid cyst reveals features of mature cystic teratoma, including a cyst wall lined with epidermis containing dermal appendages. The wall may also contain glial tissue (Figures 1 - 3), or mature lipomatous, cartilaginous or bony tissue. 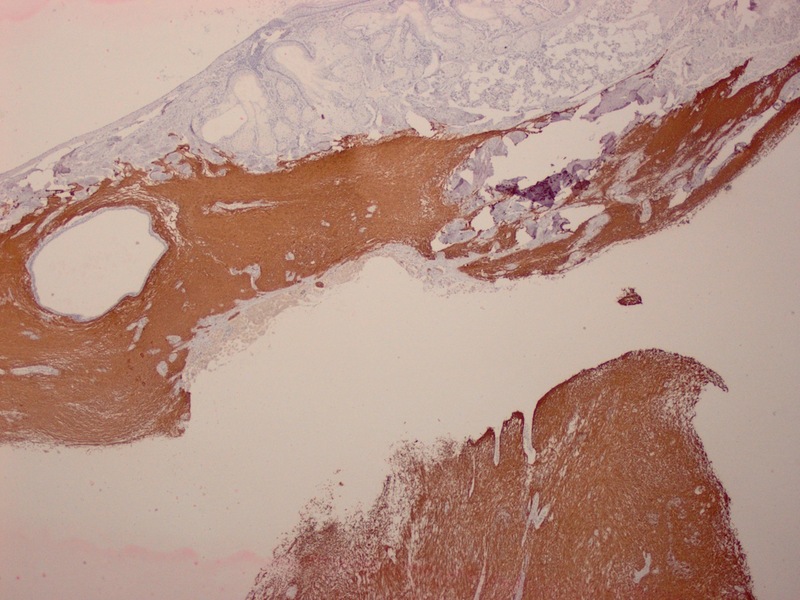 Within the cyst, there is an area of loose connective tissue containing stellate or elongated astrocytes in microcystic regions. Rosenthal fibers, which appear as bright pink ropey or sausage-shaped fibers, are seen throughout (Figures 4 and 5). 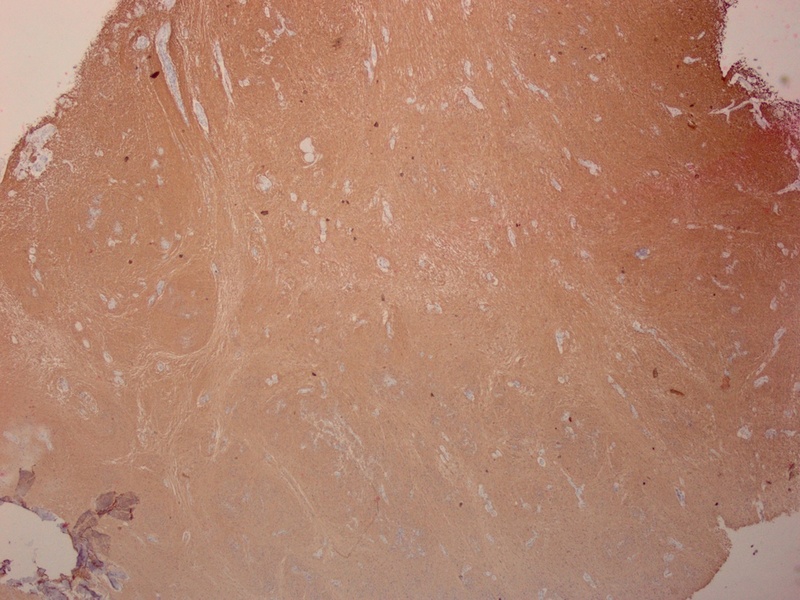 The tumor is immunoreactive for glial fibrillary acidc protein (GFAP) (Figures 6 and 7). Mitoses are rare in a grade I lesion (Virchows Arch 2002;440:105). Microscopically, astrocytoma, WHO grade I, in a dermoid cyst is identical to its counterpart arising in the central nervous system. 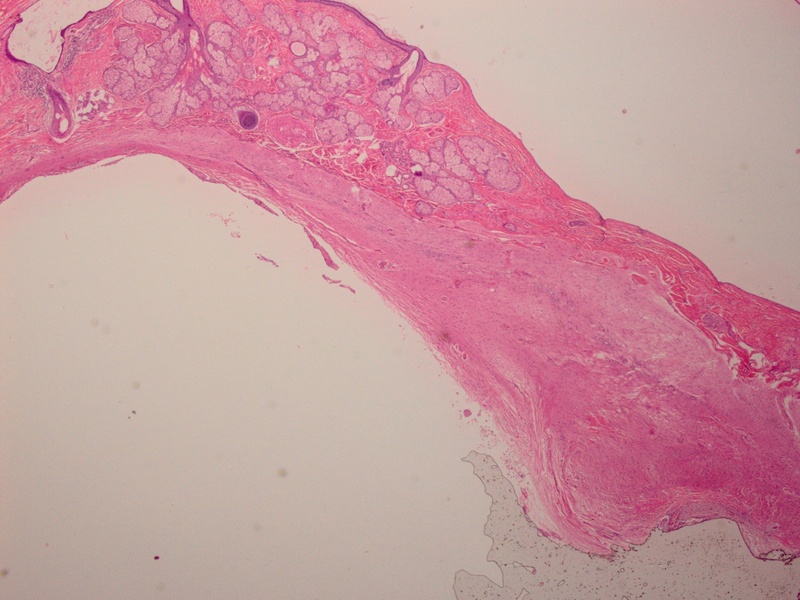 If more primitive areas are seen, the differential diagnosis would include an immature teratoma, although this entity would demonstrate greater diversity of neuroepithelial differentiation as well as a more extensive and varied admixture of endodermal, mesodermal and other ectodermal tissues. This distinction is important as immature teratomas have malignant potential. Clinical stage seems to be the most important prognostic parameter of survival, and patients with clinical stages I and II have fewer recurrences and overall longer survival. Stage I and II patients may receive surgery as the only therapy, while stage III and IV patients may receive additional chemotherapy and/or radiation (Histol Histopathol 2008;23:765). Additional references: Kurman: WHO Classification of Tumours of the Female Reproductive Organs; 2014 (4th ed, Vol 6).